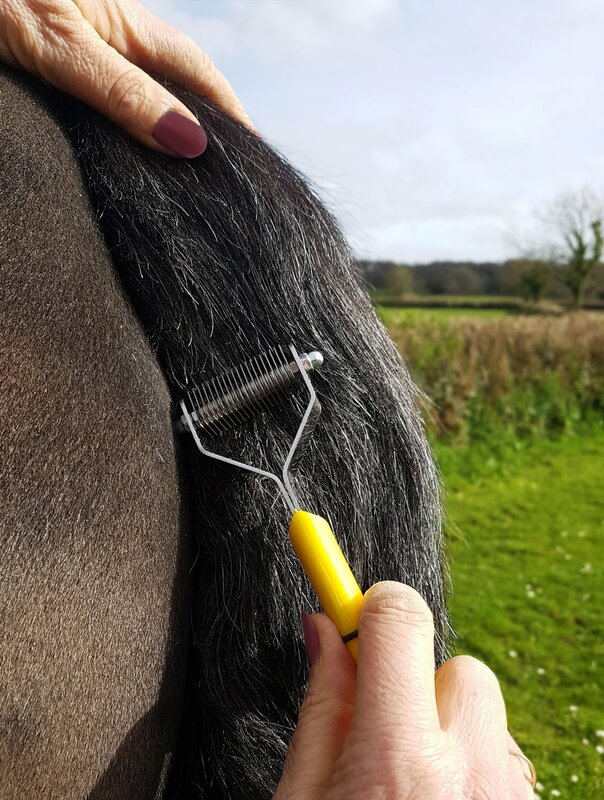 Smart Tails Easi- Grip yellow handle range will give you the show ring finish in minutes with zero discomfort to your horse and safe for you to use too. It takes blades that are replaceable or interchangeable as needed. If you are looking for that smart professional “pulled” look or just want more definition and less bulk to the mane or tail, then choose from either coarse, medium, fine or super fine grades depending on the finish. Use evenly down the sides of the tail starting at the top and working down, blend into a tapered look towards the end of the dock. If you are not sure of the finish you would like, do a bit each day and then damp down and tail bandage for an hour or so. Check and then do a bit more until you get the finish you require. If you want a more natural finish and just looking tidy, choose a coarse or a medium grade. For a closer finish choose fine, although a medium may be needed to start with if the tail is very thick.